Can you achieve 100% up-time? As an online registration provider, we strive for 100% availability of our event management software. This is very difficult to achieve in practice, and we occasionally have outages ranging from a few minutes on all servers to intermittent performance for hours affecting only specific customers. Our customers' reaction to these hopefully infrequent episodes ranges from understanding ("oh well, I have a lot of other things to do right now - I'll check back later.") to complete outrage ("I'm losing paid registrations! I have to get this report to the hotel now!"). This article, On-Demand Outages the "New Normal"?, takes the interesting view that as people become more familiar with daily usage of Software as a Service (SaaS) such as our online registration technology, users will realize that these outages are inevitable and they will adjust their expectations and actions during the occasional downtime. No one is immune to the problem - the article references recent and period performance troubles at major SaaS companies such as Salesforce, Blackberry, and Google Apps. 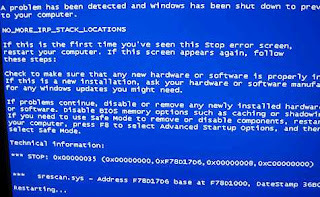 I remember the early days of Windows when the "blue screen of death" was an unwelcomed part of my daily routine. Reboot, stand up and stretch, login, get some water, wait for the programs to open, pick back up where I left off. The blue screen probably did me more benefit ergonimcally by interrupting long sessions slouched over at my PC than they caused me harm - that is, once I learned to control my temper. I'm not excusing poor performance or saying that we won't get better (as we have in the past). But maybe we as users need to begin to consider intermittent outages of SaaS as unavoidable and expected, and thus we should create contingency plans for what we will do when they happen (besides freaking out).